A Room Humidifier is an appliance which sits on a table or the floor, and is designed to add moisture to the air that circulates in the room that they are in. During the winter, cold air from outside has low relative humidity, so when it is drawn inside and heated in your furnace, the relative humidity drops even lower. This is why in the winter, skin, plants, wood, and leather dry out so quickly, and you can get a static electricity "shock" when you walk across carpets, etc. Air dryness causes not only personal discomfort, but also damage to furniture and other furnishings. Raising the relative humidity in the winter with a humidifier also helps you feel more comfortable at a lower temperature, which helps save energy. Depending on the model of Room Humidifier that you have, the unit puts moisture into the air by using mechanisms such as misters, rotating wet drums, or pads. 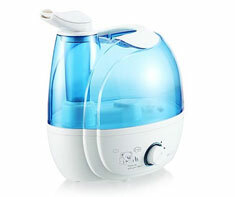 A Room Humidifier is different than a Whole-House Humidifier. A Room Humidifier sits on the floor or table in a single room, while a Whole-House Humidifier is integrated with the ductwork of your Forced Air Heating System (and in some climates, your Central Air Conditioning system), and is designed to add moisture to the air that is circulated throughout your entire home. Central Air Conditioning, Dehumidifier and Forced Air Heating. Shown in the 'Routine Care' section are the recommended routine maintenance tasks for your humidifier. The 'Q & A' section shows answers to common questions. And the 'Articles' section provides helpful articles about your humidifier.